I didn’t know what I was getting into when I took on C.J. 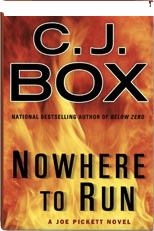 Box, as a new author – and I’m not sure, now that I have just closed the cover of my first, Nowhere to Run, that I know yet. How do I feel? I think tricked might be one word, or trapped perhaps – into feeling like I should somehow feel tolerant of extreme and shallow right-wing sentiments that made no sense to me before I began this book and make even less now. The shallowest of those sentiments – come out of mouth of Diane Shober, a young woman who went out for a trail run while training for Olympic trials and never came back even after an extensive, and likely very expensive, government search. Game warden Joe Pickett discovers her living freely on government land near survivalist twin brothers who put Pickett through a harrowing near-death pursuit that begins when he tries to ticket them for fishing over the limit and without a license. Box builds the self-absorption into the character. I’m okay with that. How anyone thinks she could have made the Olympics given how little spine she displays is beyond me, but it’s the worst of many muddled inconsistences of character. I just don’t understand why Warden Pickett lets her ride off without explaining herself – and getting her to pay “the government” back for two or three major search and rescue missions. And wouldn't she want to vindicate the brothers? I’m still looking for a character I can grab onto and like a little – someone who has at least one honorable trait or motivation I admire. Not the Brothers Grim, the survivalist twins, fleeing real injustice over eminent domain property rights, injustice perpetrated by a land-grabbing developer in cahoots with a corrupt Senator. That developer happens to be Brent Shober, Diane’s dad, a cut-throat capitalist who exploits bad laws and political connection to get whatever he wants. Box tries hard to neutralize negative reactions to the brothers and comes up short. Perhaps Pickett was overzealous in his pursuit, but they slaughter horses, assault and leave him for dead. I feel bad for those bullied by crooked politicians – who somehow get twisted into seeing all government as BIG BAD government, and I also feel bad for serial killers who were bullied as children, BUT . . .. In Box’s world of I-can-do-whatever -I damn-well-please individuals, no one stands out as sympathetic. Not outlaw Nate, a fugitive buddy of Joe’s that I don’t get enough info about to feel anything one way or another. Not Pickett's overwhelmed wife Marybeth and girls– though I like all of them a little. Not the bumbling opportunistic Farkus, though I do find him most amusing along with Joe’s overbearing mother-in-law. For a while I think Pickett's okay, but his motivations are alternately I'm just doing my job, I took an oath, Or I'll do it for the distraught mother. Maybe I should admire the noble bow hunting poachers who started this whole mess when they turned themselves in to complain that the body of the elk they shot, disappeared. But they don’t make sense to me either. Why would they do that? I could whine on, but more would be disingenuous. While reading, I enjoyed this book and I’m likely to try another – from the library. Truth is Nowhere to Run was an entertaining page-turner for me – and as long as I didn’t think about the book and its muddled characters with their muddled motivations, I was highly engaged. As long as I didn’t think it might offer me any insight on the issue of property rights, I could consume it the way I occasionally enjoy fast food. And I loved getting to ride through the Sierra Madre and see a new part of the country.